There are those who accuse Joss Whedon of being a "false" feminist, claiming to empower women while still clinging to entrenched cultural misogyny. We're not going to bother poking any (well-deserved) holes in that position, because anyone with even a shred of common sense can do that for themselves. But isn't there something to be said for the fact that Black Widow's costume was never unzipped to show off her cleavage? 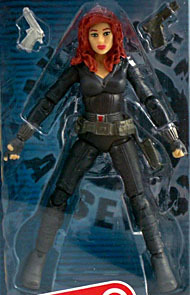 As a master martial artist, espionage specialist and top-ranked spy, Black Widow has always avoided the spotlight. So to find herself as a part of the world's first team of Super Heroes [sic] feels strange. She is proud of her place on the team, and confident in her abilities, but whether she can stand to work alongside an egotistical billionaire and a bellowing giant remains to be seen. There was supposed to be a Black Widow figure in the Iron Man 2 toyline, but it (along with the unmasked Don Cheadle War Machine and an unmasked Tony Stark) was still MIA when the line was cancelled. Really, the only "actor" figures that made it out were Whiplash and Nick Fury. Anyway, that means we've been waiting two years for a 4" Widow, and now she's out - but is still really hard to find. The figure doesn't share any parts with the IM2 figure, which is fine: that was a nice mold, but technically she wore a different costume in Avengers (I guess?) and surely that would have bothered some people. To my mind, she wore a black catsuit in IM2 and a black catsuit in Avengers, and thus they're the same costume. It's not like she switched to the gray outfit from the '80s or the '90s one with the red stripes on the sides, you know? A little bit of piping isn't what I consider a "change." Anyway, this toy captures the film details perfectly, with a crisp sculpt on the many layers. The only thing missing would be the straps that hold her holsters to her thighs. 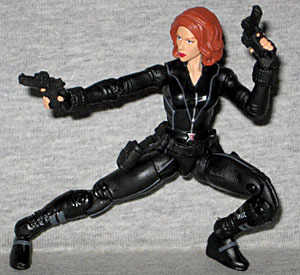 The paint is sort of a mixed bag, but full disclosure, this is the only Black Widow figure we've been able to find in any stores, so there's no telling how common these complaints will be. Anyway, her torso is glossy black, while the rest of her body is more matte. Her skintone is good though, matching well between her neck and head, and there's no mess on her silver zipper, the SHIELD logos on her arms, the skin peeking through her gloves, or the dark grey on her boots and piping. The likeness is very good. There's no angle from which the tiny head doesn't look like Scarlett Johansson. The face on the cancelled IM2 Widow was pretty far from the mark, but this one is great. If anything had gone wrong with the sculpt, the molding or the paint, she wouldn't look this good, so excellent work, Hasbro! 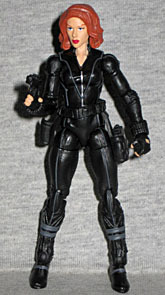 The articulation on the Avengers toys has been cut back, even further than it was for Captain America, but Black Widow has come out quite well. She moves at the head, shoulders, elbows, wrists, hips, thighs, knees and ankles. The only thing missing is a waist of some sort, but that still puts her ahead of most of her teammates. The knees are double-hinged, and in addition to having a hinge in the ankle, there's also a "rocker" swivel so she can keep her feet flat in even extreme poses. The only bad part is that the knees are made from a very soft PVC, but at least the figure is light, so she shouldn't warp over time the way, say, Deathlok and Longshot did. 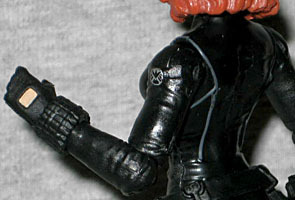 Black Widow comes with two small black pistols, made from the same soft plastic as her knees. That means when you try to put them in her hands, or push them into the holsters that hang from her separate belt, they just want to bend rather than actually sliding into place. It's an annoyance, but not terrible. 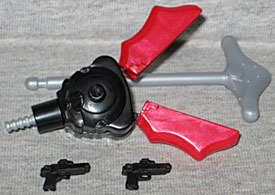 She also comes with what the package calls a "grapple launcher," but is actually the same "harpoon blade" Fandral had. At least it's molded in black and red, so it matches her colors. It can also be plugged into her back, via a GI Joe-style backpack hole. 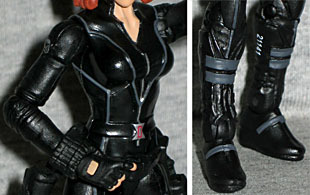 If not for the lack of a way to turn her torso, this Black Widow would be a contender for Toy of the Year. Yes, the spongy plastic is less than ideal, but everything else about her is so good that it kind of evens out. The face is beautiful, the articulation is plentiful, and what little paint there is is applied well. Even the action feature is relegated to an external accessory, rather than being part of the figure. The only reason you wouldn't buy her is the current scarcity, and for your sake, we hope that gets worked out really soon!